Last night we went to Don Pepe for dinner, which used to be my favorite Mexican restaurant until Habeneros opened...I just love Habeneros! Anyway, we usually eat Mexican every Friday night but haven't been in a while so it was Taylor & Sutton's first Mexican meal. They split a cheese quesadilla and fries and loved it. I think they were more about the atmosphere than the food but that's okay. They made friends with about 4 different waiters, the hostess, and some of the other patrons. Since it rained all day yesterday and we stayed in, I think they enjoyed getting out and hamming it up for a while. We'll have to take a picture next time to post on the site because I forgot the camera last night. We have had a couple of really bad nights w/ Taylor lately. Thursday night I was up with her for 4 1/2 hours w/ her crying and on Friday night she woke up at midnight screaming and crying and we couldn't get her back to sleep until 3:30 that morning. I thought she had a tummy ache because she usually doesn't act like she's in pain when cutting a tooth, she's just fussy. Today when I got her up I was rocking her for a few minutes to let her wake up peacefully and I heard her gritting her teeth. And then it occurred to me that you can't grit your teeth if you only have 2 bottom teeth! 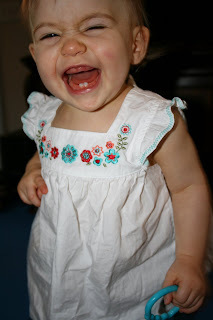 So I stuck my finger in her mouth and sure enough...our little Taylor has a new front tooth on the top. Won't that be so cute in a few weeks? Taylor thinks everything is funny! 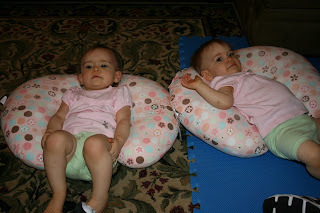 The girls have really taken to laying in their boppies and watching Baby Einstein. 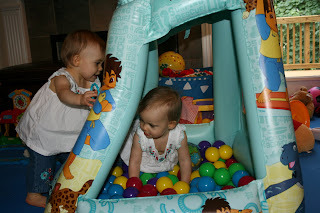 Daddy bought us a new ball pit and we love it! Saturday night I had my 20 year high school reunion and Taylor and Sutton went to spend the night w/ Nana and Papa. We had no idea what to expect since this was their first time to spend the night away from home without either of us being there and we were so worried that they would be up all night crying. The back of my car was completely full and it looked like we were moving them in over there! We had 2 pack n' plays, two feeding seats, food, clothes, toys, etc. Babies are high maintenance. Anyway, they apparently had a wonderful time playing outside, took a bath (Nana said she was as wet as they were.) and went to bed at 9:15....and slept until 8:00 the next morning! We were SO happy to hear that they did well. So who wants them next???????? 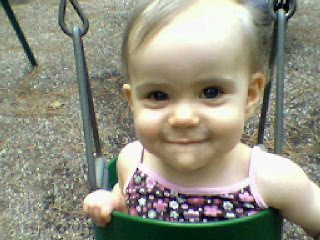 I took the girls to the park for the first time several weeks ago and we had a good time. It was hard to take two kids that could barely walk to the park by myself but we made it. It was a short visit...when Clint goes w/ us we will stay longer. They have a swing at our park that you can put two kids in back to back and when I saw it I was so excited because I thought it was perfect. Especially considering I was by myself...one mom, two babies, and a double swing. Well, they did just the opposite of what I thought they would. Sutton loved it and Taylor hated it. You just never know with these two who will like what when. Taylor is usually the daredevil and Sutton is more standoffish. I took Taylor out of the swing after a few minutes but Sutton stayed in and couldn't get enough of me pushing her, and high I might add. She was grinning from ear to ear the entire time. 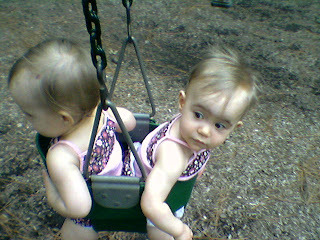 Taylor was just fine w/ me holding her while sissy was swinging. On our walk back home some lady let her gigantic dog run up to Taylor and lick her in the face. Neither of the girls have ever been around a dog other than Maxwell before so she was scared to death and started screaming franticly. I hope she isn't scarred for life. Who does that? The dog was on a leash so all she had to do was hold him. Some people just don't think. 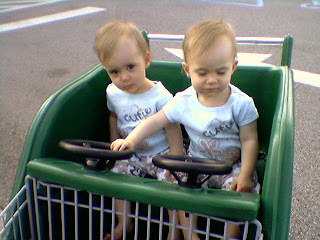 Finally, the girls are big enough to ride in the buggies that are made like race cars. I can once again buy groceries...yippee!! Before I had to put one in the front and one in the back. I usually had to put Taylor in the front because she's a little escape artist so Sutton was in the back throwing things out as fast as I could put them in. Plus she had groceries stacked all around her and chewed on anything and everything I put in there. Now, if they could just somehow adjust the cars to where you could actually turn them without taking out anyone within a 10 foot range of you it would be great. Seriously though, if you're in the grocery store and see a mom struggling to make a turn just move on out of the way because you might loose a toe. 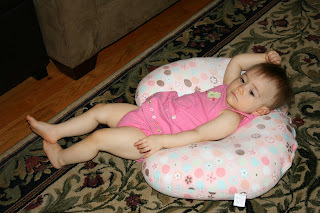 Taylor needs to learn to relax a little...she's always so uptight! I think her daddy taught her how to do this. They can pretty much eat whatever they want now with the exeption of nuts (peanuts and peanut butter especially) and shellfish. If you wait until 2 years old to introduce these foods it cuts way down on the chance for allergies to these things. I want so badly to give them a good ole' PB&J sandwich but we'll have to wait. Their friend, Caden, has peanut allergies and that is bad stuff! We want to avoid that at any cost. Plus, they don't know what they're missing anyway. The doc told us to go ahead and start them on whole milk and ween off the formula (did that 2 weeks ago), he told us to start them on sippy cups and get them off the bottle (did that 2 months ago), he told us we could turn their carseats around to face forward (did that 6 weeks ago)...so we are all caught up! He said if he didn't have the paperwork to show that they were preemies he would never guess that they were born so early and that they are doing just great. Clint and I took our first trip without the girls and we made it through without coming home early! I wasn't sure I would make it. We went to Destin and stayed at the Sandestin Hilton in the Ambassadors Suite for 3 nights. I told Clint when we checked in that we just needed to send for the children that I was not going to want to leave. Bunny and The Aunts came to stay with the girls and I think they all had a great time. I hope I didn't drive them too crazy calling to check on the girls...only 3-4 times a day. That's not that bad, right? I am betting that once they got back to Atlanta they all went to bed early! First, let me say that I know you cannot even SEE a bump or bruise in this picture but I promise you it's there. We just didn't capture it very well in this photo for some reason. Oh dear golly! I knew it was coming but not quite this bad. Thursday night was a complete frenzy. Clint was out of town (of course) and the girls and I were winding down for bed. I was on the sofa and look over just in time to see Sutton do a literal nosedive off of the chair onto the hardwoods. I'm talking HARD...the entire weight of her body landed on her head with nothing to break the fall. I hurdled over the sofa and scooped her up. Immediately her head flopped over to the side and her eyes rolled into the back in her head. My first thought was "oh my gosh, she's broken her neck or back and I've moved her" so I laid her down on the floor and grabbed the phone to dial 911. She was barely crying at all which was even scarier because normally she would be in a tizzy and terrified after falling like that. The first EMT was at my door in, no joke, about a minute and a half, tops. I had no idea where he came from but I was so glad to see him! The following EMTs showed up about 5 minutes later. Now, I never walked outside to see who was there and or how many trucks there were because obviously I was sitting w/ Sutton but we had crews from 3 different stations show up and I saw lights-o-plenty a flashing outside. My neighbors must have thought there had been a mass murder or something! They asked me if she had had a seizure or been knocked out and I said no, but I thought she looked like she was going to w/ her eyes rolling back into her head the way they did. That has never happened before and I hope it never happens again. 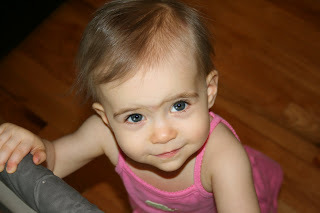 They checked her out and within about 10 minutes she was crawling around and smiling at the guys. 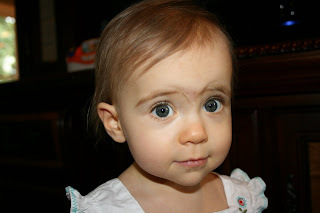 Poor Taylor was all upset and confused about what was going on in her house and why her sissy was crying. They asked if I wanted her transported to the ER and after talking w/ them we decided that I would take her myself. I really had no choice. There was no way I was sending my baby by herself in an ambulance (unless it was a life or death matter) because she would be terrified and I couldn't take Taylor w/ us in the ambulance. So, I called my mom and she and John came over right away to keep Taylor and Sutton and I headed to the ER. Did I mention the rain that night? It rained like it hasn't rained in 5 years....torrential downpours...couldn't see at all. 280 and rain don't mix well. It took me 45 minutes to get to Children's Hospital because not only was it raining but there was a wreck and only 1 lane open. Ugh! So, back to Clint....he was out of town...I called him and was as calm as possible in telling him that Sutton had taken a bad fall, the paramedics were at our house checking her out and we were going to the hospital. He flipped out! He threw his things in the car and was on the road in all of about 2 minutes. He met us at the hospital ER just as we were about to be called back...good timing! After being examined, the doc said she really needed a CAT scan to make sure nothing was fractured or bleeding on the inside since she hit so hard and of course we wanted one done to make sure everything was okay. We felt so sorry for her while she was getting her CAT scan because she was terrified. Two men took her and wrapped her up like a little baby burrito in blankets, then laid her on the machine, strapped her down, strapped her head down, put some stabilizers by her head and stuck her in there. She was screaming at the top of her lungs until the pretty flashing lights came on and she was as quiet as a mouse...until they pulled her back out. Man was she ticked off! 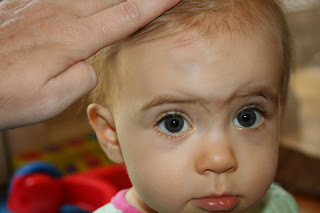 About 45 minutes later the doc told us she looked great, no problems and just to keep a close watch on her for the next couple of days. That poor baby was awake until 1:30 in the morning and was barely cranky at all. She fell fast asleep on the way home and has been fine ever since.